Well, I have not been in the mood to write, but figured I needed to send you something this morning before I go down to the "mole hole" (my basement work shop not much larger than a mole hole) and resume work on the repair and upgrade of Miss P'fer, my faithful 1991 Kolb Mark III. 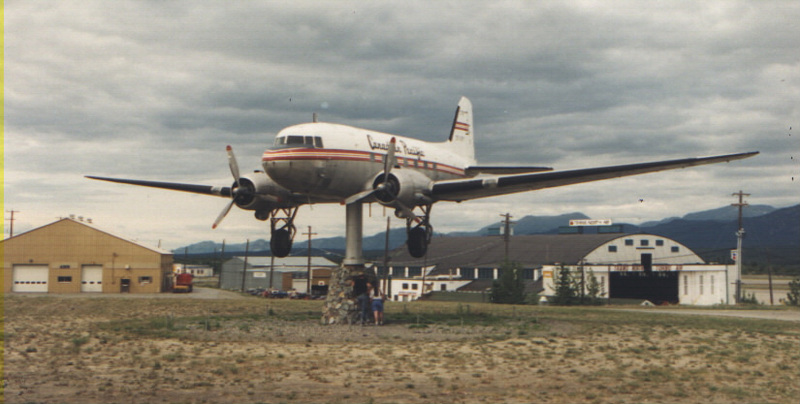 When I landed at Muncho Lake, British Columbia, 1 July 2000, the Mark III had 1,445 hours on the clock. After I lost the left main wheel on touch down, ground looped to a very unsophisticated halt, I discovered I had damaged the left wing and aileron, wiped off the left main landing gear, broken off the right wheel, and did some minor damage to the nickel steel leading edge to one of the Warp Drive Prop blades. Also had some minor dings to the tail boom and fabric from the rocks and gravel that I stirred up on landing. It was too much repair work to try to accomplish in the wilds of northeast British Columbia, just south of the Yukon Territory border. But I figured that repairs would be quick and easy once I returned to Alabama with the airplane and commenced repair work. Well, I was wrong as usual. After the long journey home, in the back of an enclosed trailer loaned to me by a good friend, I discovered the glacier dust, rocks and gravel, and the Alaska Highway had taken its toll on my new Lexan. It would also have to be replaced. Another major task. The more I disassembled the airplane the more I discovered needed to be repaired or replaced. By the end of next week, should have the fuselage ready to move from the "mole hole" to the hanger at Gantt International Airstrip, my 750 feet long grass airstrip in my neighbor's cow pasture. At that time I will bring the wings home and start repair of the left wing and recover and painting of both wings, flaps and ailerons. I wanted to fly Miss P'fer to Sun and Fun, which commences 8 April 2001, but at the moment does not look like she will be ready to fly in time. Why am I going through all this explanation of recovery and repair? We are going to make another attempt to fly to Oshkosh via Point Barrow, Alaska, the northern-most point of the US and the North American Continent. 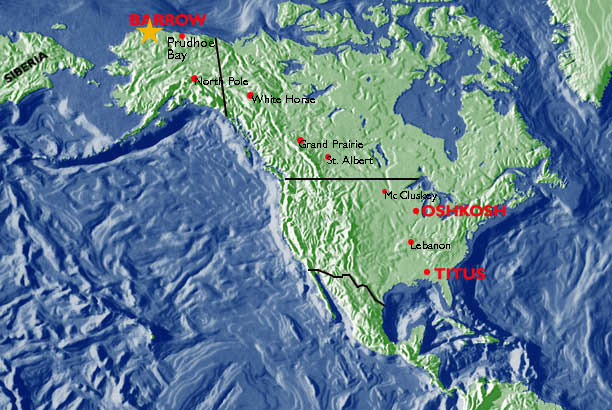 During our (the airplane and me) first flight in 1994, we were within 205 miles of Barrow, Alaska, when we had to turn around and head south. 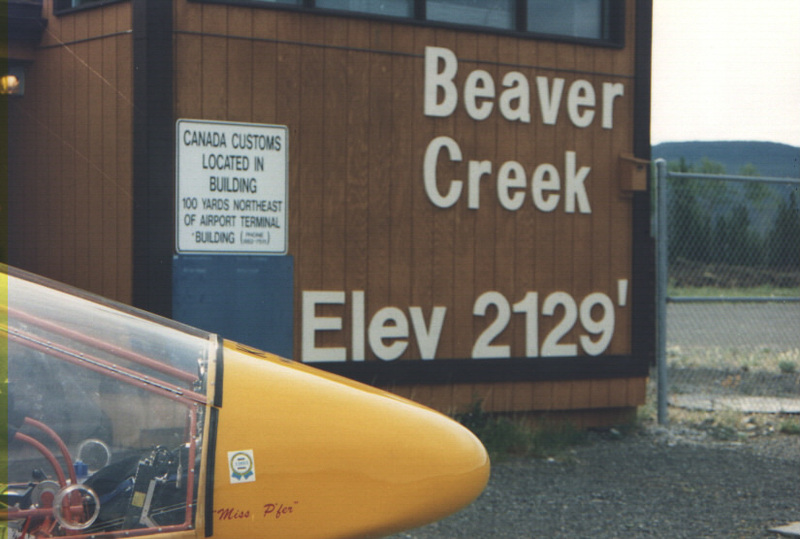 Second attempt in 2000 ended at Muncho Lake, BC, with a broken airplane. This Summer we will try again, having upgraded our landing gear and inspected, repaired, and replaced any item of equipment or part that we deemed would possibly fail and prevent us from accomplishing our mission. 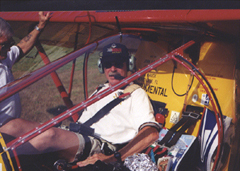 I intend to depart my airstrip in Titus, Alabama (approximately 25 miles north of Montgomery, Alabama), 24 June 2001. This will allow me 30 days to fly to Point Barrow and back to Oshkosh by the first day of the Air Adventure Fly in, 24 July 2001. By the time I return home, after a week at Oshkosh, I will have been "on the road" for approximately 40 days, flown about 10,000 statute miles, spent nearly 130 hours in the air, and burned nearly 600 gallons of 100LL aviation fuel. All this we expect to accomplish in a Kolb Mark III ultra light that is 10 years old and will have more than 1,500 hours flight time on the airframe. Our average speed with be between 75 and 80 MPH. I will fly the trip strictly solo with no prior established schedule for when and where I will be at any specific time, except to try and make it back to Oshkosh by 24 July 2001. I will carry all my required equipment for the flight with me in the aircraft. I sleep under the wing most nights, staying in motels about once a week to take advantage of hot showers. I eat when places are available, or rations I have on board the airplane. I will be 62 years young when I make this year's flight. I hope to have the Mark III flying in a month or so. This will give me time to get back "in the groove", get the airplane "up to snuff", and have time to do some warm-up cross country flying before I depart 24 June. John's work on the Mark III has really turned into a major update for expendable items, e.g. fuel lines (have gone to automotive neoprene), updated fuel sight gauge (previous left him hanging once it hit the bottom of sight gauge. It still had approximately 4 gallons left, but could not see the level to determine how close to the big "E" fuel level was getting). Updated from 14A vented to 20A sealed battery, replaced starter and master solenoids, engine upgrade, reg/rec, some flight and engine instruments, throttle and enricher cables, new larger oil cooler and oil lines, new radiator hoses, increased size of rudder trim tab, King KX 99 VHF refurbished at factory, upgraded from Garmin 55AVD to 95XL (have to send the 95XL back to Garmin for replacement of internal memory battery, checkout and update), waiting for new BRS 5, 1050 HD Softpack to replace aged Second Chantz Pocket Rocket, Sigtronics SPA400 upgrade to SPA400N and new wiring harness, replace Commant passive GPS antenna with active antenna (26db gain) from Wolfe GPS Accessories. Last September, changed out the windshield and glass door, elevator and rudder cables, and replaced elevator and rudder hinges, and tail wire bracing. John has been hard at work on his mountain bike, doing push ups and sit ups. This is the same regimen performed before his 1994 flight and it paid off then. The physical exercise helps maintain stamina, keeps his head sharp (well, as sharp as can be expected), keeps him going on those days he doesn't find a restaurant, and it simply "makes me feel better". My hands and fingers are so stiff and sore it is difficult to type this morning. That's what happens when we age, spend several days trying to get the fuel system and lines in the right positions and configurations. Its a bear pushing neoprene lines on AN fittings, then pulling them off and trying something again, and again, and again. Heck, I thought I had it right the first time in 1992. :-) Finally got it together the way I wanted it (the fuel system) about 2000 last night. I have a loop of fuel line from the tank outlet (lowest point of 25 gal fuel tank) down under the tail boom and up to the Facet fuel pump. At the bottom of the loop is a "T" fitting, drain line runs forward to the lowest point of the fuselage where there is a drain valve. A very inexpensive "gascolator" that gets the job done. Lengthened the fuel site gauge to indicate when the engine is going to stop because of fuel starvation. Old system was good to about 4 gal remaining, but that was with the fuel at the bottom of the site gauge. The last 4 gal was run on the clock and guessing. Very uncomfortable feeling. New site gauge is accurate down to .5 gal reaming when fuel is at the bottom of the site gauge. Right now, before I get to actually fly and test the new 912S, looks like about 6 minutes flight time left when gauge indicates empty. No 20 minute warning light here, Gang. Miss P'fer better be on the ground before fuel hits the bottom of the gauge. Still got to rewire intercom, radio (damage the squirrel did, and something I have been putting off until the last because I do not want to do it); install throttle and enricher cables; fill with oil and prime oil pump; fill cooling system; check out everything real good, then hit the start button for the first time (maybe today, I hope). Whoops! Forgot to put the 72" Warp Drive on. Better do that before I hit the start button. After we get the engine running we will finish up the BRS installation in the center section. Took several weeks to figure out how to install the new parachute. A little more difficult than my old 2d Chantz. Coming up with the best workable solution for installing equipment is time intensive. As soon as we get everything "tidy" (wash 4 months of dust and crud off the MK III) we will be ready to test fly. One other thing and I will shut up, "the wind." Don't know that there are any hard numbers for max wind or crosswind component capability. My rule of thumb is, "I don't fly if it is not comfortable." When it ceases to be fun, time to land. All Homer Kolb's airplanes have the ability to fly in a lot a wind. I do not know how much. We demonstrate their capability, pretty much, at Lakeland and Oshkosh almost every year. We feel this is a "feather in our cap" because usually when things get real rough, only the Kolbs will still be in the air. length. Very cautiously taxied to tie-down. I think the important thing to remember when "caught in high wind" is to stay "cool", keep the nose of the aircraft into the wind, let the airplane fly, keep a good margin of airspeed over stall, do not try to overcome or fight the wind, take your time and find a safe place to put it on the ground. A bush pilot in Alaska told me not to worry about terrific downdrafts, I would not be blown into the ground. The wind has to go somewhere and it is not into the ground. I believe him. This is how I do it. I am not telling you to fly like I do, but it does work for me. We will be posting John's progress as available here. The official send-off ceremony was held at The New Kolb Aircraft Company in London, Kentucky on Monday, June 26, 2000. Pictured to the left: John Hauck's family came from as far away as Florida to wish him well on his journey and show their support. WHEREAS, John R. Hauck is a retired US Army Special Forces Helicopter Pilot, Vietnam Veteran, and Factory Pilot/Consultant for The New Kolb Aircraft Company. WHEREAS, John R. Hauck is departing from London, Kentucky in his Ultralight Experimental Aircraft for a round trip, solo, unsupported flight to Barrow, Alaska. 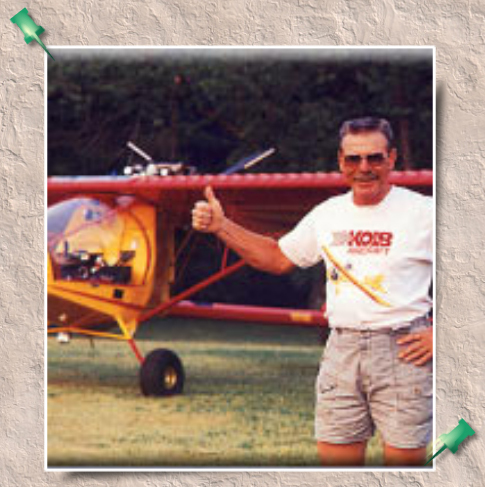 WHEREAS, John R. Hauck's aircraft has been awarded multiple Championships throughout the country. WHEREAS, he has distinguished himself with his skill in aviation and in planning extensive excursions and is revered as a motivator of aviation adventures. WHEREAS, his accomplishments will inspire fellow citizens to endeavor aviation activities, which lead to the healthy development of the community and its citizens. NOW THEREFORE, DO I, Ken Smith, Mayor of the City of London, proclaim Monday, June 26, 2000, to be AVIATION AWARENESS DAY in the City of London, declare the City's firm support for the adventures of aviation, and urge all citizens to join me in this observance. Bruce Chesnut, The New Kolb Aircraft Company Executive Board Member, presented Mayor Ken Smith with a commemorative patch depicting John's adventure and two more for John to fly with him and present to Mayor George N. Ahmaogak and Mayor Jim Vorderstrasse when he arrives in Barrow, Alaska. John was asked to make a small speech, but he was a little choked up with the special ceremony. He gave a thumbs up, received plenty of hugs and well wishing for his grand adventure. He departed Chesnut Knolls Aviation Foundation Airpark for Barrow, Alaska. It just gave you goose bumps! He circled around for a farewell pass and photo pass, and was off north to Alaska. Pictured to the right: John climbs in Miss P'fer and prepares for take off. MONDAY: After leaving The New Kolb Aircraft Co. at Chesnut Knolls, John encountered weather systems he had to get around. In contrast, he also had sun and puffy clouds with HOT weather. He stopped in Joliet, Illinois for lunch which included a hearty meal of liver and onions. That was a needed break since he was loaded up with coffee and doughnuts from his departure ceremony. John lamented not being able to thank everyone at the ceremony who supported and helped him. Miss P'fer is flying great. The first day was tiring for John and he wondered "again" what he got himself into. He believes he will be in the "groove" within the first week. After flying 7.9 hours and covering 528 miles, John landed about 8pm for the night in Lone Rock, Wisconsin (lat 43.184465 lon -90.20171), which is about 40 miles west of Madison. The airport offered no restroom and the cafe was open Tuesday through Sunday. He tent camped under the wing of Miss P'fer and had lots of coffee in the morning. TUESDAY: John's day started out discovering he left his toothbrush at Kolb. He flew 8.4 hours this day. It seems like hard work with constant 10-20 mph head winds. John tried climbing to 8000 feet to get away from the head winds and found temperatures at 35 degrees along with the same head winds. He decided to fly the deck, and has been doing so most of the trip. With the mid-west terrain, John is not too excited and says he's just "grinding them out". He feels like it will be hard work until he gets to Dawson Creek, British Columbia. John started traveling in long pants (Levi's) and leather jacket today. The temperatures have been staying around 60 degrees. Lunchtime found John at Alexander, Minnesota where he borrowed an airport courtesy car and drove to a Chinese buffet, and found a K-mart to replace his toothbrush. He stopped at Jamestown, North Dakota, intending to stay for the night, but he couldn't get fuel. They were working all night resurfacing the runway, so that meant not a good nights sleep. He headed northwest and wanted to make it to Devil's Lake, but didn't have enough fuel and storms diverted him, so he stayed the night in Carrington, ND (lat 47.450083, lon -99.123491). He tent camped under the wing at a family run ag spray place who just tucked him under their wing. They were really nice people, and had a brother who runs a lodge at Northway, Alaska. John said if he gets a chance, he will stop by. Again, the Kolb Mark III (Miss P'fer) and the Rotax 912S are doing great. WEDNESDAY: John checked in with the webmaster about lunchtime (EST), and was in Minot, ND. He intends his next landing to be in Canada at Estevan, Saskatchewan. From Minot, John called customs in Estevan to make arrangements for getting into Canada. Having done so, it made it real simple with no problems. When he arrived, they gave him his number and that was it. He was really glad he made prior arrangements as he witnessed another guy in an Agcat getting "torn apart" by a customs official. At Estevan, he rested (snoozed) at an FBO for a couple of hours and was also able to grab a shower. It was the first one since he left, so it was a treat for him. John threw in a reminder that he has been flying over agricultural country for three days. He flew on up to Moose Jaw and there was absolutely nothing there except a big agricultural operation. He really had a hankering for that Cold Oven Pound Cake Shirley Chesnut made and sent with him, but he couldn't find it. Finally, he unrolled his tent, and there it was. So, to his delight, he was able to sit on the tire of Miss P'fer at Moose Jaw, Saskatchewan and enjoy some wonderful homemade goodies. "It is great to have something homemade that far down the road," said John. 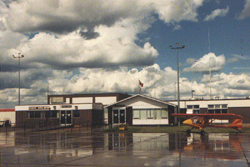 John flew on to Davidson, SK (lat 51.27, lon -105.98) and tent camped under the wing for his third night. Davidson Airport offered a neat 2000 foot grass strip. Nearby was an Esso Truck Stop which supplied his hot supper. John says he's "doing great, but not driving as hard as he did six years ago". The weather has been beautiful, 75 degrees, and he has had to resort to not wearing his jacket. He has been running his engine harder with the headwinds at 5200 rpm which give him a ground speed of 72. When the head winds worsen where he gets 65 mph ground speed, then he takes a rest break and flies again later in the day. The head winds seem to have taken their toll on John this day. He ended the day feeling beat down and worn out. THURSDAY: After having a hot breakfast at Esso Truck Stop, John started out this day with a light tail wind until it warmed up and started blowing out of the west. The population is starting to thin out. The headwinds picked up by the afternoon, so John is retiring in Vegreville, Alberta for a few hours. Vegreville is about 40 miles east of Edmonton. John has calculated he is about 160 miles from Whitecourt; 303 miles from Grande Prairie; and 367 from Dawson Creek which is mile "0" of the Alaska Highway. He met the local flying club during a meeting and gave a talk with them about his trip, and they all enjoyed looking at Miss P'fer after the meeting. The flying club offered John a place to pitch his sleeping bag for a few hours before he resumes his flight. John anticipates flying until about midnight. He indicated he would make it to Whitecourt tonight and possibly Grande Prairie. West of Edmonton the population will become sparse, so he will have to carefully choose how far to try and get. After John took off after his nap (about 6:30pm mountain time), he proceeded to fly past Edmonton, Alberta just to the north side. When he got west of Edmonton, he saw 50-100 deer... all eating out of cattle troughs. All his life, he had never seen so many in one spot. In the evening, the wind dies down and he has less head wind. He made it to Whitecourt, Alberta (lat 54.15, lon -115.68) and stayed the night. Again, in his tent. He just really loves to travel that way. The people at the flight service station were extremely nice to him and was just "tickled to death" to have him there. They chatted and visited for awhile and they let him use the kitchen and bathroom facilities. For dinner, he at one of his MRE. He was "very, very tired" and got to bed about midnight (mountain time). He got a good nights rest. The temperatures suited him. It was nice and cool at 50 degrees. FRIDAY: In the morning, he packed and loaded, had plenty of coffee at the flight service station and was on his way. The morning seemed to start off warm, so he left with a t-shirt on. After 10 minutes in the air, he decided he had to land and get a jacket on. The highway was under construction for the most part, but John did manage to find a finished area and he landed there. He flew on to Grande Prairie and landed at the airport for lunch at the airport restaurant. On final, he noticed a W.W.II A-26 next to the highway. He thought it was a monument, and he circled around, but found it was a recent crash site. It was a walk-away accident which happened the night before and was still under investigation. The area has about 5-6 A-26s all painted the same which they use as spray planes for the forest area. Pictured to the left: John stops at Dawson Creek, British Columbia which marks mile zero of the Alaska Highway. John had a hot lunch and was on his way again. He saw his first moose today flying at 1000 feet between Whitecourt and Grande Prairie. John cut the engine and turned to go back and try to get a picture. He fumbled for his camera but the silly strap got hung up and the moose outsmarted him and tucked away from being photographed. 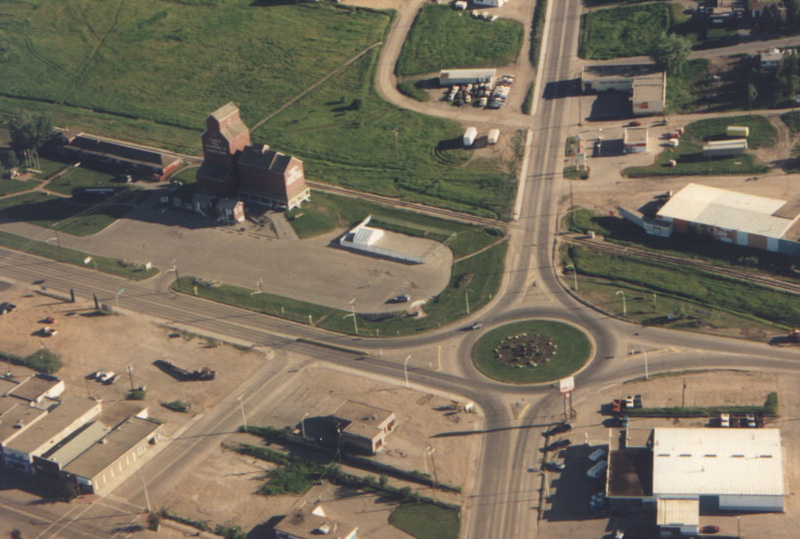 As he headed on to Fort St. John (from where he checked in), he flew over Dawson Creek (pictured). At this time, he was having some coffee and getting ready to file a flight plan for Fort Nelson farther northwest in British Columbia. He is now about 60 miles up the Alaska Highway. John sounded quite chipper today; just thrilled to be in British Columbia. Pictured to the right: John arrives in Fort St. John, British Columbia. At this point he is not sure where he will be spending the night. He thought maybe at the Sikani Chief air strip where Mae's Kitchen is located. It would be a great place to have breakfast. He is less than 1500 miles from Barrow, and will still have to deal with head winds for awhile. Pictured to the left: John intends on stopping for breakfast at Mae's Kitchen. So far in John's travels, he has been averaging 7.4 hours a day of flight time. He said, "that's not bad for an old guy!" John made it to Toad River (lat 58.85 lon -125.23) before he decided to call it a day and stay the night. For the first time on his trip, John stayed at a Lodge. A real bed and shower was just what was needed and felt good. SATURDAY: John had breakfast at Toad River Cafe with another Kolb Firestar owner, Jerry, from Colfax, Indiana. Jerry is riding his motorcycle to Alaska. .
Pictured to the right: Toad River, British Columbia, where John enjoyed breakfast with Jerry. Pictured to the left: Muncho Lake, British Columbia. John was really amazed there wasn't more damage and felt fortunate, even though his trip will be cut short. Because of the wing damage, John feels it safest to call the trip short. If it wasn't for the wing damage, John would consider going on, but he feels the wing covering needs to be removed and additional examination performed. John reported the incident to the Canadian Officials and was preparing to contact his insurance company. At this time, John's preliminary plans are to catch a flight to Fort Nelson, then on to Edmonton, back to Alabama where he will get his truck and trailer and return, accompanied hopefully by his best friend Nell, and pick up Miss P'fer at Muncho Lake.  According to Norm Labhart, president of the New Kolb Aircraft Company, "The most fortunate thing is you are not injured. If it wasn't so close to Oshkosh and us having committed to completing the release of a new aircraft, we would send a truck with parts, portable welding equipment and get you back on your way." From John Hauck -- A note to let you all know I returned home last night, Wednesday, 5 July 2000. Started my homeward journey by hitch-hiking a ride in a motor home the 150 miles from Muncho Lake, BC, to Fort Nelson, BC, where I RON'd (remained over night). Next day flew on Teenie Weenie Airlines, eventually arriving at Calgary, Alberta, where I RON'd again. BTW: I started my return home Monday morning, 3 Jul 2000. Got up yesterday morning before daylight and flew to Denver, then Atlanta, and finally, Montgomery, Alabama. Every flight was late. Every connection required double-timing to get the connecting flight. Needless to say, I was worn out when I got home yesterday evening. No one is any more disappointed in not finishing this flight than me. I spent six months preparing myself and my airplane to complete it. When I departed home last month I was sure the airplane and I were up to the task. However, 1441.4 flight hours and more than 4,000 landings and takeoffs, many from rough fields, most with maximum braking, hauling very heavy loads, finally took their toll on the main gear leg/axle socket on the left main gear. 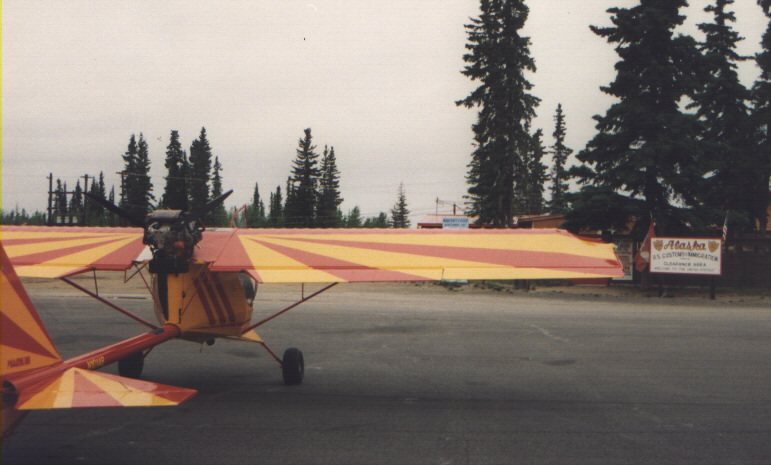 The socket failed immediately on touch down at Muncho Lake, BC, Saturday morning, 1 July 2000. Took me totally by surprise when it failed. The socket was not standard Kolb hardware, but a specially designed and built piece by my Brother Jim and me. Its time of failure was reached on that last touchdown. The loss of the left main wheel caused a ground loop which eventually wiped off the superstructure of the left main landing gear. In the process, the left wing tip, aft portion of the outboard rib and aileron were damaged, the right main axle socket broke, and the antenna and landing light were also wiped off the bottom of the fuselage. The damage is severe enough to warrant ground transporting home rather than attempting to repair in the field. As soon as I obtain the use of a enclosed trailer, 5th wheel or bumper hitch type, minimum 24 feet long inside, I will return to retrieve the MK III. I have several friends searching the local area for a trailer to get the job done. The Alaska Highway to Muncho Lake is in good condition this summer, with only two short construction areas of several kilometers each. Time is of the essence to retrieve the MK III. The lodge where my personal gear is stored, along with some to the MK III parts, will begin charging me $20.00 per day effective 17 July, two weeks from my departure. Also of concern is the fact that the fuselage is still located where it came to rest, in an area that is not completely secure. The New Kolb Aircraft Company would let me use one of their trailers, but the timing is such that all their trailers will be used to haul aircraft and supplies to Oshkosh. I can not wait until after Oshkosh to go get my airplane. I am grateful that the problem happened where it did and that as the result I was not injured. Had it happened at the next landing I would have probably been at Liard River Emergency Air Strip, 10 miles from the nearest telephone, with no way to secure the airplane or my gear, or make outside contact. Someone was looking out for me. I thank everyone for the support of my flight, for your faith in us, Miss P'fer and me, that we would try our best to complete our mission. We did that. From John Hauck -- As of right now, I have a trailer lined up to retrieve Miss P'fer and my personal gear from Muncho Lake, BC. A friend and fellow retired Army Aviator has offered me his 24 ft enclosed trailer. Am driving down to Enterprise, Al, in the morning to pick it up and get it ready for the trip. I want all of you to know how much I appreciate your concern and support. I would like to answer each email personally and individually, but I am pressed for time and just can not do that now. The clock is ticking. Monday after next the Swiss proprietor of the Northern Rockies Lodge will start charging me $20.00 per day. That adds up quick, even in Canadian dollars. If I get out of here Monday I will probably arrive Muncho Lake 8 days later if I have no problems in route. A couple days at Muncho to get loaded, squared away, and a little rest, then back down the highway to Alabama. Trip will involve approximately 7,600 miles in its entirety. 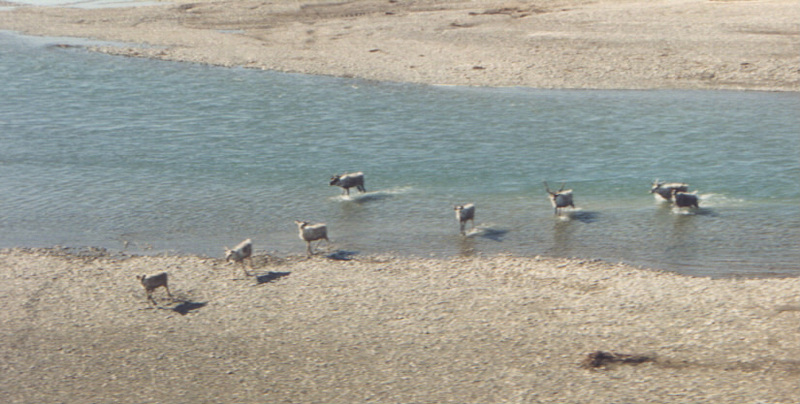 One high light will be a trip to the Liard River Hot Springs about 25 miles north of Muncho. The water is so hot you have to get down stream from the source to keep from getting boiled like a lobster. However, it even makes old bones and muscles feel good. Again, thanks for your help and support. Makes an old guy feel good to know he has so many friends out there. Maybe I can make it all up to you all one of these days. I am sorry we (me and Miss P'fer) could not have finished our flight. Everything was going so good. However, we still have an unofficial record from the 1994 flight. No one has come close to that flight in any type of aircraft that I know of. I have a feeling it will stand for a long time. 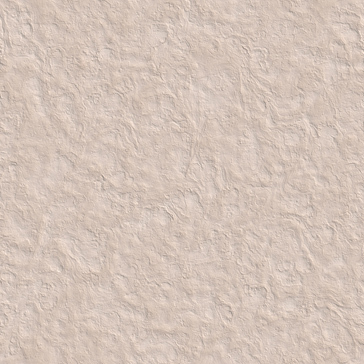 A tribute to our little Kolb airplanes that can do just about anything we want them to do. They are safe, strong, fun, and for the most part, will always get you home. :-) Even the best horses get sore ankles once in a while. PS: Do not know if I will have time to make Oshkosh this year. If I do not make it, I will see you all in Lakeland or Oshkosh next year. I am ready to paint the last red sunburst on top of the repaired wing today, if it quits raining. Then all I have to do before first flight, since 1 July 2000, is stick the wings and some little things back on. Probably end of next week before I start flying. Got my new sectionals and publications yesterday. Will be ready to go before you know it. Miss P'fer, The Hauck Special, flies. After resting in the nest for more than 11 months, the Hauck Special has not forgotten how to fly. Felt great to be back in the air again. Engine ran great. Did about 30 minutes taxi tests and static WOT runs. a. Main gear legs 2 inches longer. b. Repositioned engine on the mounts in the standard position, rather than with the front of the engine raised 5/8 inch. c. Seats are 2 to 3 inches lower and 2 inches further aft. d. Replaced 2 inch prop extension with a 4 inch extension. e. Upgraded wheels and brakes, with 3/4 inch axles and tapered roller bearings. Changing seat and gear legs changes my perception of where the main gear are when landing. Will take a few more landings to get comfortable with that, but I like the new improved seat back frames and position. Will be a lot more comfortable and less tiring on long days in the saddle. The engine coolant and oil temps seem to be running warmer. Guessing that the prop extension or change in engine position has influenced this change. Air speeds seem slower, but I have not calibrated the static system since I replaced the pitot/static hoses. I am also getting indications of lowered stall speeds in all configurations by about 4 or 5 mph, so I think it is indications and not true speeds that have changed. New landing gear and wheels work great on pavement, better than my old set up. Did some fast taxi tests on pavement. She tracks straight with no tricks. The new wheels and brakes are rated at 1,100+ lbs. The old UL MATCO's were rated at 600+ lbs. Brakes are much better. On pavement, they pull the heavy MK III to a halt in just a few feet. Nice smooth stop with no tires screaming and smoking. Feels good. Didn't have a chance to do any cross wind landings on pavement yet. That may be another story. I plan on raising the front of the engine back to where it was last year, 5/8". Calibrate static system to get the true airspeed closer to IAS. The 4" prop extension seems to have reduced prop noise. I'll have to get the engine repositioned and calibrate airspeed before I can tell if there is any change in performance. I am hoping that we may have increased thrust, but won't know until we get set up to make another test. With all the work and changes, I am happy and satisfied. A little tweaking here and there and she will be her old self. I plan to put about 50 hours on her before I depart for Barrow. I must fly enough to feel that everything is going to remain operational for the duration of the flight. 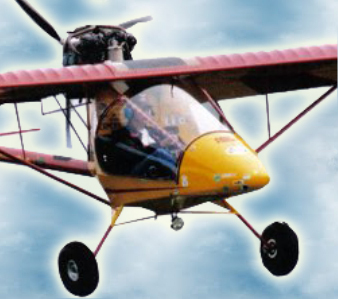 The 1994 flight was accomplished with no mechanical problems other than midrange carburetion problems. If the 912S leans out in midrange in cold air, I will be able to put the fix on it by raising the fuel needles a notch. I haven't had a chance to test the engine in freezing weather, nor my Chille Vest, but I am sure I will before the flight is over. Tentative departure from Gantt International Airport is 1 July 2001. Twenty days and counting. Getting ready has got to be the most difficult, time consuming part of long cross country flights. Warp Drive prop blades returned to factory for refurbishment. Increased main landing gear legs 2". Increased wheel and brake weight by 3 lbs each side (6 lbs). Recovered, repainted left wing, aileron, and flap. Removed Firestar aileron counterbalance weight rods and replaced with MK III weight rods (don't know what the difference in weight is, but the amount of rod extending from the socket is a couple inches shorter. Prop is pitched 11.5 deg, same as last year, turning 5,000 rpm cruise. ASI is calibrated with GPS to within one or two mph. With the 4" ext and engine on the mounts in the stock level attitude, I was aprox 80 mph. With the front of the eng raised 5/8" aprox 82 mph (this puts the thrust line, static, 90 deg to the bottom of the wing). Yesterday with 2" ext and front of eng 5/8" above level, she cruised about 86 mph at 5000 rpm. I guess I will stay with the 2" ext which is noisier, but gives me the edge on cruise speed. The 4" ext did seem quieter, but not enough to give up increased cruise. The MK III also seems to climb better with the 2" prop, but still not getting the numbers I was last year. I did a 120 xc last yesterday evening to Ted Cowan's airstrip south of Opelika, Alabama. Felt good to fly somewhere instead of going around in circles. I need to get the carb heat installed in order to thoroughly test prior to departure for Barrow. No matter how much it cost, if it save me from an engine out because of ice, which I can confirm I encountered at Toad River, BC, last year, then it is worth it. Sort a like a parachute. My Whelen strobe system that has operated without a problem for almost 1500 hours went inop on the way back from Ted Cowan's last night. Since strobes on both wings are inopt, it is probably a power supply problem and not the power pack. Maybe a bad switch, switch connection, or power plug to the power supply box. I do not feel comfortable with those strobes flashing. In the final stages of preparation for departure. This morning will install the carburetor heat system I obtained from the Pegasus people (Rob Rollinson in Indiana). The carb heat kit was fabricated and shipped from England. The system uses hot water from the cooling system to heat coils wrapped around the air filters to preheat intake air and prevent carb icing. This system was used by Brian Milton on his round the world flight and another gentleman from Britain who flew a trike to Dead Horse, AK. Until I experienced icing during my approach into Toad River, BC, last year, I was not overly concerned with it. Now I want to be prepared for any and everything that Mother Nature and this flight can throw at Miss P'fer, the Hauck Special Kolb Mark III, and me. If all goes well and I am satisfied that the Kolb Mark III and I are ready, I will depart from Gantt International Airport (all 750 feet of grass in the cow pasture) next Sunday morning, 1 July 2001. I wanted to depart yesterday, 24 June, but repairs and preparation did not allow it. It is quite time consuming when one person is responsible for everything involved in preparing for a flight of this magnitude. Much more time than I had anticipated, even though this is the third time I have prepared for a flight to Barrow. Repairs went well, the aircraft is flying great. I will have a few days to test the carb heat system to insure it will perform satisfactorily prior to departure. The new main landing gear system is working well, as are the upgraded wheels, brakes, and tires. Weather on the North Slope has been hitting the 40's and occasionally 50's the last few days. I have my fingers crossed that this warm trend will continue during my stay in the Arctic. My latest estimate for this flight is approximately 10,000 miles (by the time I return home), 130 flight hours, and 650 gallons of fuel. With good weather and winds, I should be in Fairbanks, Alaska, in 7 days flight time (at 8 hours per day). Then another two days to Dead Horse and finally Point Barrow. However, there is a good possibility bad weather will be encountered which will keep me on the ground at some time flying north as well as south. I pray for favorable winds and clear skies, but Northern Canada and Alaska has a reputation of inclement weather with little or no warning. I have to take what I get. Time is short and I still have a lot to do. I am excited about the flight. I know from past experience these long days and nights in preparation will be worth every minute of it when I push the throttle forward and start my take off roll next Sunday morning. What a joyous relief that will be. Just a quick note to bring you all up to date. Everything in on track and going well. I should have no problems getting out of Gantt International Airport first thing Sunday morning, 1 July 2001. I am getting ready to go to the airstrip to do final prep on Miss P'fer, my MK III, a gracious old lady. All that is left to do is change spark plugs, oil and filter. Then, she said she would like to have a nice bath and she will be ready to load for the flight. The spark plugs have 115 hours on them. Recommended replacement time is 100 hours on the 912S and 200 hours on the 912. I left them in so I could start out with fresh plugs and also to see if there was any degradation in performance. None noted, as I suspected. They looked good when I pulled them out at 94.5 hours. I won't take anything that I do not need to take, but I will not leave anything at home that I need. The above list was taken real quick from memory, so it is not all inclusive. I have a check list that I will go over methodically prior to departure from home to the airstrip to load the airplane. I carry 7 days clothing. As I get further north and the weather becomes cooler, I can wear the same clothes for two, three, and four days at a time. Just remembered an important item. When one "roughs it" as I do on long XC's, disposable "baby wipes" are ideal for a quick and effective French shower. There have been times when it has been a week between showers, but the baby wipes do their job before I bed down in the tent. Almost as good as a hot shower. If I luck out with good weather I should make it close to Kansas City, MO, the first day, Minot, ND, second day, Fairbanks, AK, seventh day, Dead Horse, AK, eighth day, and Barrow, AK, day eight or nine. That is if everything, including me is 100%. Realistically, it may take me longer to get there. The carb heat system from Pegasus is installed and seems to be doing its job. I can control its operation from the cockpit. Placed the on/off valve in the center section over the left seat (I fly right seat). It operates on hot water from the cooling system. When it is on, ever so slightly deflects the tack needle. Hardly noticeable. This will be good insurance for me, as I encountered carb ice on approach to the air strip at Toad River, BC, last year. Better get busy or I will miss my ETD, less than 48 hours from now. Had fog and low ceilings with some rain when I left Gantt International AP. Had to fly to the east and north of Birmingham, AL, because of weather. Got put down by low ceiling at Pell City, AL, approximately 56 miles north of my strip. Finally got to Olive Branch, MS at 1340 hours, where I was met by Kolb List member David Jones of Hernando, MS. He took me to Cracker Barrel for a Sunday dinner and then filled Miss P'fer to the brim with 100LL. What a guy. He has one of the old Kolb Factory FireStars, think a KXP or whatever they were called back then. It is primarily a Boston Maroon color. You all ain't gonna believe me, but I fell into it here at Lebanon Airport, MO. After having a feeling of not wanting to land here, I landed a few minutes ago after flying 7.5 hours today... about 580 miles. I am about one and a half hours out of Kansas City, MO. I advise everyone that cross countries to RON at Lebanon, MO airport. This is the most hospitable FBO I have ever been in in all the years I have been banging around little airports. Upon landing, I attempted to get camping gear out when staff of the FBO came out and invited me in, showed me a different place to tie down, and even tied down Miss P'fer for me. I am hooked up to my email through their computer. There is food in the frig, hot coffee, a shower, telephone, TV, air conditioning, etc. Don Baxter gave me the run of the place. He left a few minutes ago. Even provided me with towels for my shower, and had a disposable shaving kit for me. I am overwhelmed. Miss P'fer did good. She was extremely heavy coming out of my grass strip this morning, plus the new 6X6 aircraft tires only had 15 psi. It was a marginal take off and I am not accustomed to them. I landed at Hamilton, AL, to take a pit stop and while there increased tire pressure to 25 psi. A world of difference on pavement and should handle the large baseball size gravel on the strips in Canada and Alaska. All systems are go. I am worn out, but will relax, get a hot shower and a good night's sleep and be ready to go in the morning. After a hot breakfast, of course, downtown Lebanon. I called Dana Labhart this afternoon from Walnut Ridge, Arkansas, to update the "Where's John" page, but no one home and left a message on her machine. Will call again in the morning. John checked in about noon today from McCluskey, ND airport after flying about 3 hours this morning. He is about an hour S.E. of Minot, ND. His goal for the day is to make it to Davidson, Saskatchewan. He has a headwind now, so not sure he may be able to make it. "I feel good. We have beautiful weather. We just need to turn this headwind around," said John. Norm Labhart got to talk to John today. He called in at about 8:00 PM EDT. John only got to fly 69 miles today. A cold front was coming through the area. The winds at one point gave him a 125-mph ground speed with an 80-mph IAS! He is currently in St. Alberta just north of the Edmonton Air Space. He met some very nice folks who allowed him to stay the night in the fields office and put the Mark III in a hanger. He is planning on getting caught up on rest after flying over 9 hours yesterday. Current temperature is 53 degrees. This morning the temperature was 65 degree at 11:00 am. Had a little worry with some leaking coolant. Tail and baggage compartment got some of the new orange coolant on them. Problem turned out to be a loose clamp. Seems when he put the carb heat on one of the clamps hid itself when it came to tightening hoses. John gave some numbers on the plane and the flight. John says he gets to think of his buddies on the Kolb Mailing list often while flying, and said to tell them Howdy. He estimates he is 3 days from Fairbanks. All is well for now. I just talked to Jim Hauck, John's brother. He seems to think John is much more relaxed than last year. After talking to John I would have to agree. John seems in very good spirits and is enjoying the trip. At 3:12 EDT John checked in from Grand Prairie, Alberta. He is 56 miles from the Alaska Highway. He has stopped here and will stay for most of the afternoon because winds are 25mph gusting to 35mph. He is going to wait for a few hours and begin flying tonight when the wind dies down. I am in Grand Prairie, Alberta, 65 miles from Dawson Creek, British Columbia, Mile "0" of the Alaska Highway. Miss P'fer is sitting outside the FBO, her tummy full of 100LL, waiting patiently for me and the wind to die down a little. I landed here at 1200, wind steady at 25 mph, gusting to 35 mph. I told the guys at the FSS to "Check this out!" I landed on the approach end of runway 25 with about a 25 ft ground roll. Jokingly over the radio I heard the FSS guys say something about showing off. I told them that I had no choice but to land like that with that much wind. It is almost 1500 hrs, wind has calmed to a pleasant 15 gusting to 25 mph. I had breakfast at 1300 hrs after I fueled the MK III. Had hoped to make Toad River today, but the wind will preclude that. I will depart here shortly and make Dawson Creek. I can RON there is I have to. If the wind dies more, it is right on my nose out of the NW, I can fly all night and not be able to log night flight. It will stay light from now on until I return further south. I only made 69 miles yesterday because of a cold front that was moving towards me. I made a good decision to stay put at St. Albert, AB, just to the north of Edmonton. I have made about 250 miles this morning, and hopefully more this afternoon or tonight. I can sleep during he windy afternoons and fly when it calms, if it calms. The airplane and I are doing great. I feel better about this flight than any I have ever made before. I am being extremely careful and cautious. There is no room for error. The further north I fly the easier it is to get in trouble. It is easy to get bit before one knows it. Other than the coolant leak caused by pilot/mechanic error in failing to make sure all coolant hoses were tight after installing the carb heat system, there has been no other problems with the airplane or me. The 912S has used no oil, is burning about 5 GPH at $1.25 per liter CDN. :-) Thanks everyone that sent me some help to pay the gas bill. I will probably have the largest Master Card bill ever when I get back to Hauck's Holler, Alabama. :-) I haven't taken time to convert price to US dollars. I am using a computer in the Shell FBO at Grand Prairie. The young man working here, Ray Trudel, gave me a set of Esso wings when I stopped to refuel at Fort Nelson, BC, on my 1994 flight. It is a small world. And, in this part of the world and especially further north, there are even fewer people. Have not seen this guy since 1994. It was 46F when I got up this morning at 0530 and 50F all the way to Grand Prairie. Field elevation here is about 2,600 feet. I got into long pants, Levis, and hiking boots yesterday. This cool dry air beats the Hell outta 100F muggy weather in Alabama. I refueled in Whitecourt, AB, this morning. Spent the night here last year. From Whitecourt I started following the highway, and will do so from here all the way to Dead Horse, Alaska, unless I have to deviate to cross the Brooks Range to Anaktuvuk Pass, approximately 60 miles west of the Dalton Highway (Pipeline Haul Road). Again I will have to leave the highway at Dead Horse to fly to Helmericks, 48 miles NW, then the final leg to Point Barrow over tundra and water. I think of you all on the Kolb List often. Will try to keep you updated on my status as often as possibly. I can assure you that this little Kolb airplane and I are doing our dead level best to do what is necessary to successfully accomplish our mission, our goal, to fly to Point Barrow, Alaska, and back to Alabama successfully and in one piece. My heart felt gratitude to everyone on the List for you interest and support. We fly the best, one of Homer Kolb's creations modified by the Hauck Brothers, the Hauck Special Mark III, Miss P'fer, a proud, capable old lady with 1,600+ hours on her airframe, showing the World her true colors on the way to Point Barrow, Alaska. BTW: We are doing it completely unsupported, solo, self sustained, the way God intended folks to fly cross countries. The way Dave and Wil are doing it also. From Joe Harrington, Lethbridge, AB: "I spoke to John on the phone yesterday when he stopped at my father's farm strip near Ardath, Saskatchewan. He had supper with my folks and then continued on due to favorable tail winds. My dad said "It made his summer" to have John stop in and "One of the nicest kind of guys you would ever want to meet". John did tell me that did lose some time backtracking due to forgetting one of his bags in Weyburn, Sask. He did not make very many miles today no doubt because of a cold front with associated thunder showers came through his path today near Edmonton Alberta." John checked in at 2:23 EDT from White Horse, Yukon Territory where he had spent the night. He has now flown 7 days, 49 hours... averaging 7 hours a day. "That ain't bad for an old guy!" said John. Before stopping for fuel and the night, John flew from one rain shower to another. He flew with his right hand on the stick and left hand on the edge of his seat to hold on. At his fuel stop, John found a nice bunk house with a nice bed and a hot shower. A restaurant across the street welcomed him with a hot meal. John hates to leave a nice cheap, dry room with hot food across the street. "I met a gentleman flying with his old dog while at White Horse. He is a Park Service person moving from Death Valley to Bettels, Alaska. I can't imagine what a change that will be for his family." John was waiting on weather before heading on to Northway, Alaska for the afternoon. He is excited about getting there. Right now he has good tail winds, and if that keeps up, he will make it to North Pole, Alaska (just south of Fairbanks). He will have no trouble flying at night, because the sun sets at 1:30am. In Northway, there is no official sunset time. There are mountains on both sides of the airport at White Horse with snow capped peaks. The temperatures have been 45 degrees with 15mph wind. At 6000 feet, temp is 32 degrees. At 7000 feet, temp is 30 degrees. This has given John plenty of time to use his new Chilli Vest. It is 12 volt powered and John says, "It works great!" John feels a bit tired, but he says "It's a fact of life. I'm not getting any exercise and it makes me feel lethargic." Miss P'fer is performing wonderfully. She is burning more fuel than last year. He has 160 hours on the engine and 1600 on the airframe. Along the way, John is meeting great people and enjoying a view of wildlife few have experienced. He saw his first moose by Grand Prairie, a mamma and baby. In British Columbia, he encountered an eagle, caribou and a black bear. While flying across the Dakotas he found coyote. John checked in at 1:54 EDT from North Pole, Alaska. He met with J.D. Smith at the airport. J.D. provided John with lodging, food, and transportation. From White Horse, John said his flights were just beautiful. He didn't remember the mountains being so beautiful. This day he landed for fuel and/or food at Haines Junction, Burwash Landing on Kluane Lake, and his last stop in the Yukon was at Beaver Creek. 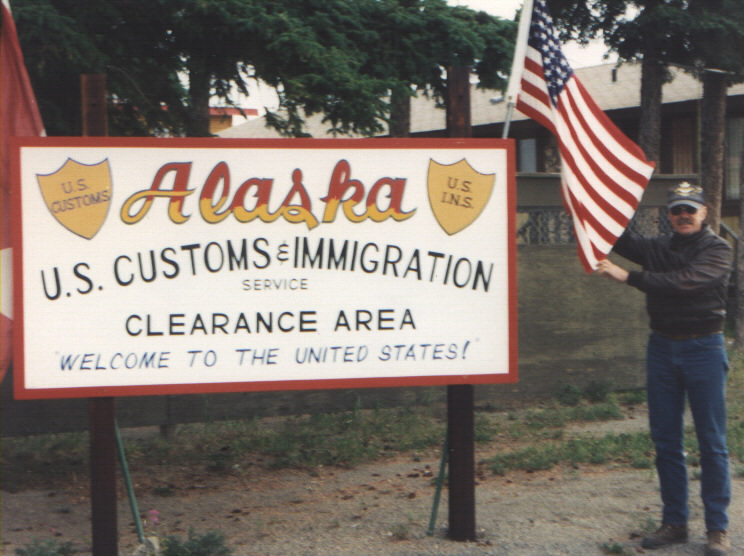 Upon arrival to Alaska, John went through customs. "Actually, it was only a phone call," said John. He described the customs official as sounding young and grumpy. His remark to John upon a description of Miss P'fer was, "Oh no, not another one." John celebrated his arrival in Northway with a giant hamburger. At 10pm, the sun is still high in the sky. Currently John's headquarters is in J.D. Smith's motor home. It is about 2.5 miles from North Pole. John plans on staying the day here, heading to Eielson AFB and rewarding Miss P'fer with an oil change and clean up. Getting ready for the rough stuff, John will head north in the morning towards Dead Horse, weather permitting. This area is known as the Atigun Pass. He will be headed to Bettles and from there to the Pipeline Road/Dalton Highway. Bettles is about 75 miles north into the article circle. Once John arrives in Dead Horse, Alaska, he will travel about 48 miles to Helmericks for a visit. This is a family and town. The town is named after the family... being the first white family to settle in these parts of Alaska. John checked in at 7:23 pm. He is still at North Pole, AK. 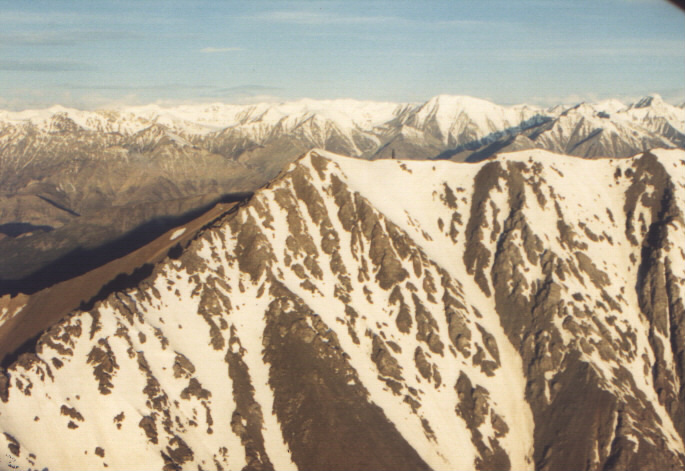 There is weather on the north side of the Brooks Range. Ceilings are at 200 feet and visibility is down to 1/8 mile. John needs to wait until weather is good enough on both sides of the Brooks Range before heading that way. John has still been staying at J.D.s place and spending time with him. J.D. is an airport manager at Fort Wainwright where John called from. He is also a retired CW4 and flew Kobras and Apache CH64s. "I'd be miserable waiting for weather to clear if I didn't have J.D. to spend time with," said John. John spent the day running errands -- Went and got his customs stamp. It was not available in Northway when he was there (another $25), purchased another calling card at Sam's Club, etc. Yesterday, after completing work on Miss P'fer, he took her for a spin over the Nenana River area and saw about 25 moose of all sizes, adult females, adult males, and their offspring. Still waiting on weather system to move out of the North Slope. IFR from the Brooks Range to the Arctic Ocean. Have been extremely careful this flight and am going to continue to do so. I want this one to be successful. Am in a good "safe house" here. Have a wonderful family to stay with and all my needs are being met. JD Smith, retired Army Aviator, and I have spent the last three nights telling lies until midnight. We met through another List and laid eyes on each other for the first time when I landed at North Pole, 2200 on 8 July 2001. Miss P'fer and I are ready to head north as soon as the weather turns VFR. This is not the place to push weather. Weather is the greatest hazard to aviators in Alaska and I do not intend to be a statistic because I became a victim of it. Have had a wonderful flight so far. Am looking forward to returning to the Arctic Region of Alaska. I love it. I do not remember the mountains through Canada and Alaska beings so beautiful as they were on this flight. Got up the other day and could see Mt McKinley, aprox 125 miles south west of here. Weather in the Fairbanks/North Pole area has been great. Temps around 65 in the day time and good sleeping weather at night. Have been making a pig of myself on halibut, Korean food, Alaskan food, and Mac Donald's coffee in the morning. Hope to have some good news for you all in the very near future. When I depart here I should be in Barrow in about two days. John checked in this morning at 10:45am EDT. He got into Dead Horse last night. He had a nice hot breakfast this morning before calling. “It’s amazing I had to fly all that way to eat grits!” said John. Anyway, here’s John’s 13th day... He woke up with a good feeling, went to McDonalds for coffee and biscuit, and headed to Ft. Wainwright to get a weather report. They reported it would be a go. 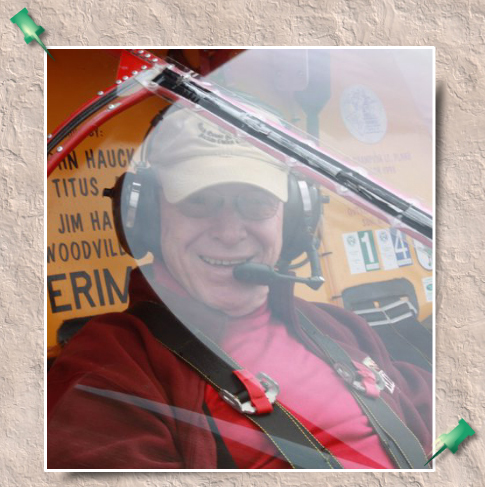 John left North Pole at 2:00pm EDT and flew to Bettles. 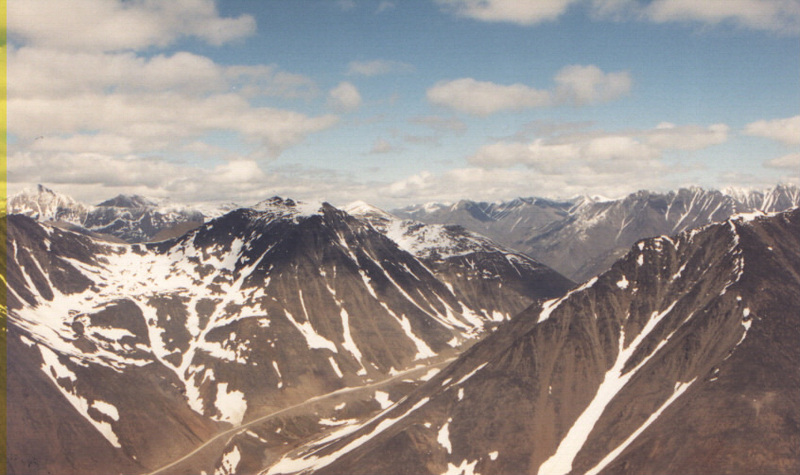 From Bettles he headed to Anaktuvuk Pass, which he found out was shorter than the Atigun Pass. The scenery was “utterly awesome” said John. While at Bettles, John encountered “a rubber necker tourist” from one of the tourism aircraft who said, “This is the strangest airplane I’ve ever seen.” John explained he has gotten lots of attention and questions at just about every landing. From there, John headed on to Galbraith Lake. It was rainy and really ify going in, but John had to go. The most serious problem John has had this trip is having to go to the bathroom. John headed on to the Dalton Hwy./Haul Road and arrived in Dead Horse about 11:00pm EDT with a temperature of 39 degrees. Flight Service reported a 22 mph wind, so John had to taxi in carefully. “It’s nice coming back to a place I’d been before because I already knew my way around,” said John. After putting Miss P’fer to rest, John walked over to the Prudhoe Bay Hotel where he stayed the night. The hotel was swamped with people, but the kind manager Jori made sure John got a room. Hot meals at the hotel were very welcomed. 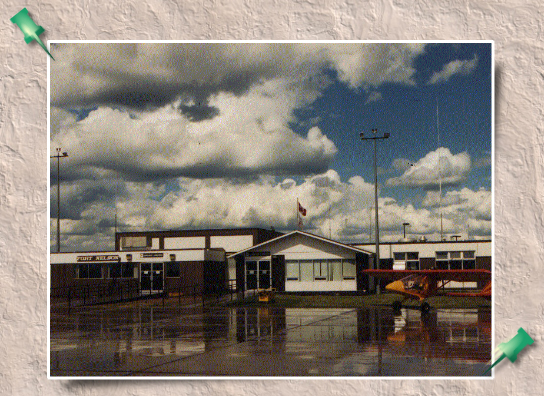 “This was the turn around point for me for my ‘94 flight due to cold weather and engine problems. This trip, the engine is performing perfectly,” said John. Following this update on his position, John will be checking with flight services for a final weather report. He expects to be in Barrow in a couple of hours. “This is the big deal right now. The really, really, really dangerous part of the flight,” said John. “I’ll probably go there, spend a short time, turn around and fly 185 miles back to Helmerick’s. I don’t want to be weathered in in Barrow. John called from Barrow.... HE MADE IT! He arrived about 4:30pm EDT. He said it was a great flight with 20-25 mph tail winds. Most of the flight showed over 100 mph ground speed with a top speed reading 130mph ground speed. He did make one stop (illegally) on a gravel runway at Lonely. (One of those breaks you know.) Barrow is the “absolute end of the earth” describes John. The pack ice is in, so there isn’t much shore. On the way here John flew by Helmerick’s place and circled. He couldn’t raise him on the radio, he circled and continued on his way. Upon arrival to Barrow, John tried to find flight service and was intercepted by a security person because he didn’t have a flight line pass. The officer gave John the 25 cent tour of the flight line. Included was the North Slope Burrough Search and Rescue aircraft... 2 Bell Jet Rangers and 1 Lear Jet. After his cheeseburger at Ken’s Chinese Restaurant, John intended to fly to Point Barrow, a sand bar and northern most point. From there he will head back to Helmerick’s. Flight service is reporting only a 5 knot wind from 6-9000 feet. “I’d hate to be up here when it’s really cold and not in the middle of July,” said John. It is 40 degrees now. He is acclimating well to the climate with his warm gear and exclaims, “the electric vest does the job.” Another reason for not staying over in Barrow is the cost of the rooms $150.00 verses $90.00 in Prudhoe Bay which includes hot meals and all the snacks you can eat. John did confess the few days time off in North Pole waiting for weather to clear was probably a good rest for him… one that he would not have chosen to take. John concludes with “I’m mighty proud of my aircraft for carrying me this far!" John checked in from Dead Horse at 1:00pm EDT. He stayed at Helmerick's place last night. Their hospitality was great and John got to enjoy Musk Ox Sausage for breakfast. John remarked he was disappointed with Barrow. It wasn't what he expected. He feels the impact of oil money has had a very commercial affect on Barrow. However, on the flip side, John is beaming with a satisfied feeling of accomplishment of a lifelong dream. From Dead Horse, his intentions are to fuel, file a flight plan and head south through the Atigun Pass. He will probably stop and visit Jack Reikoff near Coldfoot, AK. It is just a little north east of Bettles so he plans to head to Bettles for fuel again and back to North Pole. John checked in from North Pole about 4:00pm EDT. He is taking one more day off for rest and spending some time with J.D. Smith. He plans to have Moose Steaks for dinner. It would not have been a good day to head south because the weather was "sour", said John. The temperatures are getting better... 57 degrees this morning. The Barrow Flight has now changed to the Oshkosh Flight. Actually, last year we were advertising the flight as "The Flight to Oshkosh, Via Barrow, Alaska." My flight has been a tremendous success for me personally and also for the Kolb aircraft that I fly. We have demonstrated we have what it takes to fly the remotest, hostel terrain in the World. My little Mark III has the guts to take me places that most only dream of. I am a very grateful man for having the opportunity to represent all of you in demonstrating to the rest of the aviation world that we ultralighters have what it takes to get the job done no matter where it is. The airplane and the engine have performed flawlessly. I took an extra day here in North Pole, Alaska, to recoup and get ready for the flight south. I will fly to Whitehorse, YT, then either the Stewart-Cassiar Highway or Alaska Highway to eventually end up in Prince George, BC, and back into the US at Oroville, Washington, sometime this weekend. An overnight stop with a Special Forces friend in Twisp, WA, then to Whitefish, Montana, to visit friends and deliver a special email I have had in my possession (in my zip lock bag with my aircraft papers) since last year. From Whitefish, MT, to Yellowstone NP. Now, if I dip south before Yellowstone, I can pick up Nevada, Utah, Colorado, and the rest of the States required to say that Miss P'fer has carried me to every State in CONUS plus Alaska. All 49 of them.. Also 5 or 6 of the Canadian Provinces and Mexico. All that coverage was flown in two or three flights in 1994 (maybe some in 1993) and 2001. I have had no mechanical problems with the aircraft or engine except a few loose radiator hoses which took a few minutes and a screw driver to adjust for correction of the problem. The carb heat system is working. I taped half of the radiator to keep cyl head and oil temps up to at least 180F and 190F. The 912S has not skipped a beat since day one, hour one. I am continually grateful for your support of my flight. With your help it has been a much more enjoyable adventure. I am doing my best to represent all Kolb builders, pilots, and "hopeful" builders/pilots. Because we had a DNF last year has no influence on our ability to complete the flight this year. My Kolb Mark III has carried me to the top of the World. I am extremely proud of her. The Hauck Brothers can build, modify, design, and update airplanes that get the job done. Thanks Brother Jim for your expertise and help. I called Homer Kolb today to tell him Miss P'fer and I got to Barrow, but he was in the hanger working on his 1985 Oshkosh Grand Champion Ultralight, the factory Firestar. Clara Kolb said she would relay my msg to him as soon as we hung up. Homer and Clara will not be a Oshkosh this year, I am sad to announce. I better get my gear in order for tomorrows departure. Take care and I hope to see many of you at Oshkosh. I should arrive there on the first one, two or three days of the show, weather permitting. John checked in at 5:08pm EDT from Northway, AK. He is 38 miles from Beaver Creek entering the Yukon Territory. He just finished a big hamburger and is about ready to be on his way. He did run into another pilot which he met before on his 1994 trip. The fellow was flying a Beech when then met before at White Horse. It's a small world. John reported the moose steaks were delicious and moose is the game of choice in Alaska. John saw Mt. McKinley today. He had to climb to 11,000 to get above the clouds and see it. John has 298 miles to fly to get to White Horse where he intends on staying at the bunk house. John checked in at 12:15pm EDT from Smithers, BC where he had stayed the night last night. Yesterday's flying took him from White Horse to Watson Lake to Dease Lake and to Mesidia Lake. Smithers was a nice place to camp and John had a MRE GI ration for dinner. At his time of checking in, he was checking on weather because there was a system around Prince George. He was now on his third cup of coffee and ready to go. John summed up his flight yesterday and the most excellent part of his flight yet. The scenery of the lakes between the mountains capped with snow and beautiful pointed glaciers was just breathtaking. The terrain today is beginning to level out. John checked in again at 5:25pm EDT from Prince George. His radio decided to go belly up. He can still hear, but can't talk. The weather was iffy south of Prince George. He said if he could manage getting out of Prince George okay (a controlled airspace) then the he would just land at uncontrolled airports because of his radio problem. If he gets held up by weather, he may tinker with it for awhile. John commented he is now making better time and may probably make the US border tonight. The webmaster is travelling for a couple of days and will not update until I hear from John on Monday. Sorry guys!